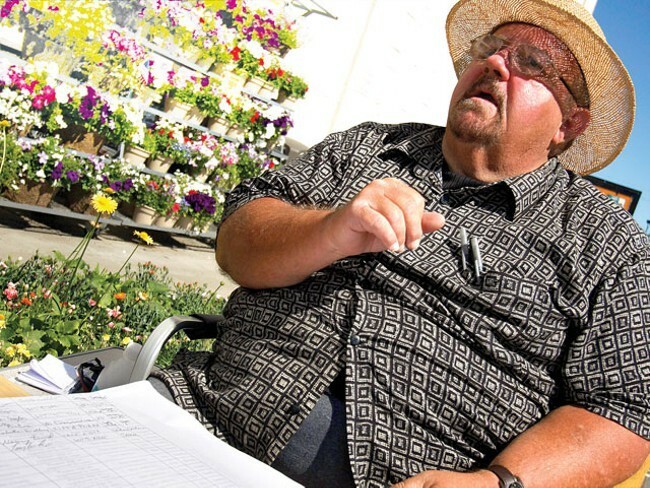 A paid signature-gatherer asks voters to sign a petition to add their names to the ballot in 2010. Local controversy-magnet Jamie Pendleton, of "Date Grape Koolaid" infamy, has had plenty to deal with over the last year, including pleading guilty to felony grand theft. But that hasn't stopped him from accusing others of breaking the law. From at least six different accounts, Pendleton has been simultaneously tweeting the same tweets, accusing activist Scott Kusel of breaking the law by raising money to pay for professionals to help get enough signatures to put a referendum on the ballot. Kusel, who had led the boycott effort against Pendleton's Daiquiri Factory in 2014, wants to reverse the recent 44 percent pay hike for Spokane City Council members. "#ScamSpokane Artist @Srkusel still collecting & paying people in #Spokane illegally to collect signatures," Pendleton simultaneously wrote from @RecallCondon, @DrinkSpokane, @SPOKANEDAIQUIRI, @1045JAMZ, @DJBABYFACEJAMZ, and @ChangeSpokane. Pendleton appears to have made the same claims on a Facebook page just created last week: That paid signature gathering is illegal in the state of Washington. In fact, it's so not-illegal that trying to make it illegal is itself illegal. In 1988, the Supreme Court found that paid signature gathering is protected by the First Amendment. "First, it limits the number of voices that will convey appellees' message and the hours they can speak and, therefore, limits the size of the audience they can reach," Justice John Paul Stevens wrote in the unanimous opinion, criticizing laws against paid signature gathering. In fact the Washington State Supreme Court went one step further. In 1993, Washington state had passed a law stating that it was a gross misdemeanor to pay petitioners per signature, though they could still pay them hourly or flat wages. I wrote about the issue six years ago in the Inlander in a story called "Clipboards for Hire." Every year, without fail, you'll find paid signature gatherers outside supermarkets asking for your signatures. If that was illegal, you can bet local supermarkets would be the first ones to call the cops. Still, Pendleton's confusion is understandable. The old, invalid law is still on the books. He cites a legislative "finding" that indicates the legislature is opposed to signature gathering. The legislature finds that paying a worker, whose task it is to secure the signatures of voters on initiative or referendum petitions, on the basis of the number of signatures the worker secures on the petitions encourages the introduction of fraud in the signature gathering process. Every person is guilty of a gross misdemeanor who... provides or receives consideration for soliciting or procuring signatures on an initiative or referendum petition if any part of the consideration is based upon the number of signatures solicited or procured, or offers to provide or agrees to receive such consideration any of which is based on the number of signatures solicited or procured. That's precisely the language that the state Supreme Court ruled unconstitutional. But it still appears in state code. To make sure the invalid law wasn't being enforced, I called up Andrew Villeneuve, founder of the Northwest Progressive Institute. They're the group that constantly opposes initiative-maven Tim Eyman. If anyone would know if it was illegal for guys like Eyman to pay initiative gatherers for every signature they gather, it would be Villeneuve. But he confirms it's not. "One of the big secrets in case law is when the court strikes down the law it stays on the books," Villeneuve says. "If you look in our statutes, there are a lot of Tim Eyman initiatives that are still there [despite being ruled unconstitutional]. A whole bunch of stuff that is no longer enforced is still there. The legislature could clean up the books and get rid of that but they never seem to." For his part, Villeneuve argues the bigger problem with the initiative signature-gathering process is not that the signature-gatherers are paid by the signature. It's that they should legally be treated like employees instead of independent contractors. "These firms do not pay their workers comp," Villeneuve says. "They do not pay employment security. They are breaking the law." To recap: Paying people to gather signatures for an initiative or referendum? That's legal. Stealing someone else's debit card and using it to commit felony grand theft? That's not legal.